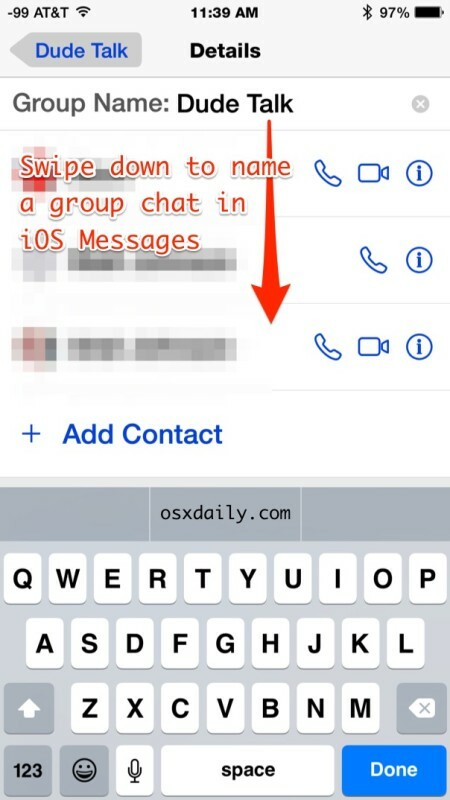 If you regularly message in group conversations or mass texts with Messages app on the iPhone or iPad, you’ve undoubtedly noticed the group conversations are labeled by the contacts involved in the conversation, like “Bob, Jon, Bill”. While that’s certainly adequate and descriptive enough, a better approach can be to assign a specific custom name to group chats in iOS Messages. This is similar to how you can assign a name to group chats in Messages for Mac, and if you change the name in Messages for iOS, it will also carry over to Messages for OS X. Additionally, the changed group chat name will carry over to all users involved in the conversation, so pick something appropriate, all contacts will see it. The screenshot examples here use the rather obvious name of “Dude Talk”, representing a group discussion of The Big Lebowski. * This can not be emphasized enough: all users in the group chat will see this group message name as it carries over to their iPhones, Macs, iPads, iPods, etc. Choose something appropriate or you may find yourself in an awkward situation (for example, if you muted a group conversation because it was annoying, naming that conversation to “The Annoyingly Chatty Quintuplet of Dunces” is probably not a good idea, they will see it). The assigned name persists as long as the group message persists, if a user leaves the group chat it will revert to the names of existing contacts, unless that person participates in the group conversation again or is re-added to form the same group. You’ll find this particularly helpful for group conversations with users that otherwise may have similar first names, as it makes scanning the Messages app much faster for conversations. It can also just be significantly more descriptive and obvious, where assigning appropriate names to group chats like “Coworkers”, “Family”, “CS571 Study Group”, “Carpooling”, etc, can really improve the overall messaging experience on iPhone. I don’t see any “Group Name” when I swipe down in ‘details’. Naming group chats requires iOS 8 or newer, don’t swipe down from the “Details” menu bar but instead tap and pull down directly underneath where the menubar ends and the first contacts name begins. That’s how you can show the Group Name section. Why it’s hidden in Messages in this way is a mystery, it’s a useful feature! Looks like this feature is only valid if all of the recipients are iPhone users. When I pull down the “details” screen I don’t see an option to name the chat?? This ONLY works if EVERYONE is using iMessage/OS X Messages. My old dumbphone did this better. Sheesh. In the “Details” area, make sure and look right below the “Details” bar after pulling down. It should show “Group Name” between that and the “Locating” area. I tested it out on my 6+ with 2 friends – both on different versions of iPhones – and it then works. This does not work if there are any Android users in your group message. Obviously, all versions of iPhones will work. So there is no way to label group text messages, only iMessages. This article is misleading. Kristine is right. Everyone of my kids, my wife & I have texted with different combinations of family members. Each combination has the ability to create a group name with the exception of those including my eldest son who has an Android. The rest of us have iPhones.